Prosopagnosia: Sometimes known as “face blindness”, prosopagnosia is a disorder where the ability to recognize faces is impaired. Renowned portrait artist Chuck Close has it. In the PBS News Hour interview below, Close reveals that he feels he has been compelled to do portraits as a way to help him remember the important people in his life. Close first became famous as a photorealist. The detail put into each work is phenomenal. Even when seen in person, it is almost impossible to distinguish one of his paintings from a photograph — a decidedly eerie experience we can attest to. In 1988, Close suffered a spinal artery collapse that left him a quadriplegic. Eight months later, he was painting again using a brush held between his teeth. With this new work, Close left realism for a pixelated take on photographic portraiture. In the PBS interview, Close also discusses how these portraits are the result of taking individual pieces of “information” to make a whole — a rather good definition of mosaics, no? Thinking of his work in mosaic terms is almost automatic. There is the “tesselation” of same-sized segments and he does create the texture and reflectivity found in mosaic materials in those exquisite details of circles and lozenge shapes. It’s as if Close creates a visual code of dots and dashes in sequences that our eye effortlessly translates into the people he loves. And one can feel the love. but he works in other mediums as well including fabric. 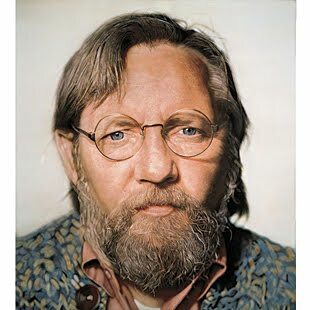 Chuck Close is also an enormously generous artist, sharing his techniques and approaches freely. We highly recommend the website: Chuck Close Process and Collaboration. And now for that video . . .
What an inspiring man. Funny you should post info on Chuck Close. I recently listened to a podcast made by the MOMA and it's great to get more info on him. Thanks. Maureen I am so envious. What an incredible opportunity. I haven't seen any of his pixelated work in person and imagine that they would have to pull me away at closing time. I do hope the Corcoran puts that video online eventually. I saw the interview before this posting and enjoyed it a lot. The exhibition at the Corcoran, "Chuck Close: Process and Collaboration", is excellent. I went on a members' night and got to spend a lot of time looking. There's a time-lapse video showing how one of Close's works is created; it's fascinating. The show is one of the best I've seen on helping viewers understand both concept and realization, and especially how important collaboration is for Close. The show is full of interesting bits about how Close came to learn how to do something, often by accident. Unfortunately, I couldn't make Close's talk at the gallery a few days before. And to see the results. Excellent "portrait", Nancie! I tried recently to reconstruct the intricacies of a Close piece using venetian glass. Very difficult but fascinating to visually dissect his techniques. It takes immense concentration to paint as he does and now..painting with this disability is just mind-boggling.